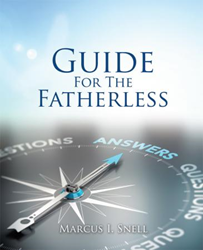 Marcus I. Snell’s new book, Guide For The Fatherless, ($9.99, paperback, 9781498457347; $4.99, e-book, 9781498457354) teaches readers to respect the position of a father and understand how vital this role is to a family, community, and the world. He explains that a father plays a unique and special role in every child’s life – one that is unable to be duplicated or substituted by any earthly being. A father is a protector to his child, a provider, a guide, a listener, and a loving disciplinarian who is stern but gentle at the same time. Unfortunately, many children are left without a father during their most formative and impressionable years. He stresses that without the head there's no body of order, and if there's no order, how can the expectancy of a child be northward? He believes that parents cannot expect to see greater from their children if they wallow in their own failures. This book provides special direction and encouragement to a Christian single parent about how to offer the appropriate attention to the child, so he or she can flourish in life. Marcus I. Snell is a dynamic man of God who for years led a lifestyle of crime and disorder that led him to a prison cell; where he himself experienced the power of God on a personal level. Having served 10 plus years in the Indiana Department of Corrections, he hasn’t allowed the prison walls to hinder the purpose of God in his life. Marcus is the epitome of what it means to be free indeed beyond any faced circumstance. The reality of his childhood along with his level of mature understanding – thanks to God – gives him the empathy to see beyond himself, his parents, and even his grandparents. He credits Jesus as the expert and he is just a vessel who was chosen to write this particular book. Xulon Press, a division of Salem Media Group, is the world’s largest Christian self-publisher, with more than 15,000 titles published to date. Retailers may order Guide For The Fatherless through Ingram Book Company and/or Spring Arbor Book Distributors. The book is available online through xulonpress.com/bookstore, amazon.com, and barnesandnoble.com.